Time Fantasy | Create Your Own Game! 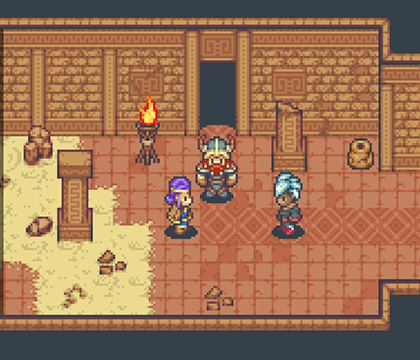 Go back to retro fantasy style with classic characters and tiles. Create your game's world in crisp pixel art with this new style. The first Time Fantasy graphics pack includes a wide variety of characters and tiles that feel like the classic RPGs of the SNES era. The massive collection of tilesets allows you to create all sorts of locations in your fantasy world: create wilderness areas in the forest, mountains or desert. Build villages, towns, or cities around a strong castle. Explore dungeons like caves or ruins and temples. Populate your world with characters: unique heroes and villains to drive your stories, multiple military factions to provide conflict, and NPCs to bring your locations to life. New style that includes character and tiles to create a whole game world. 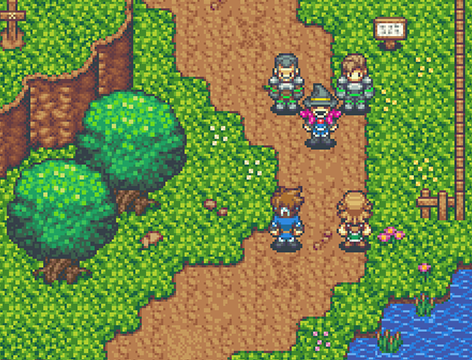 Retro pixel art like your favorite RPG classics. Over 80 unique character sprites. Heroes, villains, soldiers and more! 5 full sheets of emotion animations for 40 characters. 29 tilesets! Autotiles and objects for forests, mountains, towns, dungeons and more. Animated doors, fires, and treasure chests. 9 page PDF file with tips and tricks to get the most out of these graphics. EXCLUSIVE BONUS: Free version of pack formatted for use in RPG Maker 2003 - a 6.99$ value!